Back when I did my trip report about my last trip to Paris I mentioned that I was going to follow up with a post about a group of Americans from New York who had impeded our Notre Dame excursion. 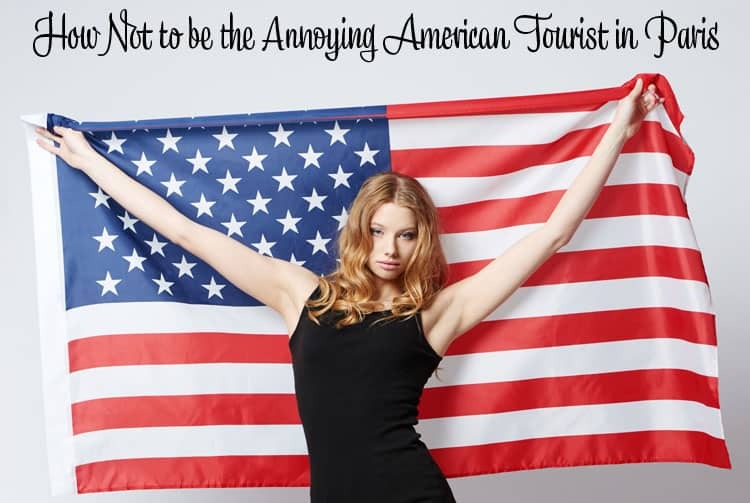 Instead of picking on that particular group because that’s not really nice, I am going to offer 3 easy tips that will prevent you from being labeled as annoying by the French, as well as fellow Americans, while visiting Paris. Tip #1: Reduce the volume of your voice by 50%. We don’t realize how much louder we speak than other cultures. I first experienced this phenomenon while working in Switzerland. I had a girlfriend who worked at the same company as I, who was also American. We would go to lunch together and have a wonderful time. But we soon realized that you could hear our voices way above anyone else’s. Our normal speaking voice is much louder than other cultures, like the French, where they are a little more discreet. So when you are in restaurants or visiting tourist attractions, like churches, think about lowering your voice out of respect for others. Tip#2 Reduce what you say by 50%. We like to talk. We get excited and we like to share. But we sometimes forget that we share our space with others. And when we are speaking loudly (see tip#1) we can take over that space without realizing by the sheer quantity of what we are saying. When visiting monuments or museums be conscientious of the people around you and how they get to enjoy the view or the photo or the piece of artwork. Some people like to quietly reflect or stand still to take a photo and can be bothered by a constant stream of dialogue. Tip#3 You can not “have it your way” when it comes to food. The Burger King motto does not fly outside of the U.S. Having traveled and eaten in both Asia and Europe, I can tell you, there is no customization when it comes to food. So don’t bring that American mentality to the table in France, or anywhere else. Eat the food on the menu as it is prepared, or don’t order it. There is no “mayo on the side;” “I want fries instead of rice” options. Respect how the food is prepared and served. If you have food allergies or other restrictions, try to do some planning ahead of time, although I can tell you are going to have a rough time, especially in France. Say “bonjour” to the room when you enter a shop, restaurant or bar, or before you start any conversation. Even if no one acknowledges you, it will be heard and appreciated. French people consider it very rude to start talking to them without greeting them. So if you enter a store and directly start shopping, and then ask for a size, etc. you will find you will have a much easier time if you enter the store, say “bonjour” (or Bonsoir if it is the evening) and then ask for help. None of these tips are meant to offend Americans. I could certainly come up with three tips for French people visiting America! It is more an exercise in being a global citizen. When you are traveling outside of your own country remember to be cognizant of other people’s cultures and social norms, it shows that you are respectful of your surroundings and that you are a conscientious person. How about you? Do you have any additional tips? Do share! Funny … I think that should apply to US tourists anywhere! I have not been out of the country for years now, but your points are quite valid! I don’t think of myself as a loud talker at all, but I can only imagine what I sound like to a tourist from another country! And the food thing.. I doubt the majority of Americans understand how spoiled we are by the options we are offered! If I have to think about it, there are very few places that I go where I do not make a change or two to what I order – even if it is only something being put ‘on the side.’ And I’ve been a waitress, so I know that sometimes it’s just a Pain in the arse to make so many substitutions. It has definitely made me re-think my own actions every once in a while. Thanks for the post! I’ll see you during IComLvWe!!! Bonjour, Andi! I would have blown it on all three bullets! Well said and I couldn’t agree more. These are the exact things that I read and heard about when I visited Paris. p.s. I took your reader survey. So true about the voice! My daughters are bilingual and when they switch from English to French, they instinctly lower their voice and when they go back to English, it is high pitch again. As far as switching what is on the menu, I am the queen of it and you can do it in France usually with no problem. But I have to say that being French does help, as I know which part of the dish can be changed and it is my mother language so I usually use super extra polite vocabulary when asking for it. Honestly Andi, you’ve completely enlightened me and you do it in such a lovely, cultured, un-american way!!!!!!!! I currently have friends in visiting San Francisco from Paris. One was raised here, the other grew up in France. All of these tips, I can see reflected in their habits. On the phone, the native Frenchman is very quiet. Just browsing personal blogs and came across yours. Love your style of writing, it’s really funny and interesting. I’ll also bear your tips in mind when I visit France sometime in the future! I think these rules can apply to most Anglophone cultures. I’ve witnessed some horrible displays of rudeness in restaurants by British people because they couldn’t get what they wanted. Also, Anglos really need to learn to NOT talk at the cinema, not even if it’s ‘during credits’. French people don’t like it and neither do I! haha, I laughed a lot. This post cracked me up because it’s so necessary and so true! I forwarded it to my friend who wants to come visit but who is extremely boisterous! Hope he’ll get a kick out of it! Andi–these are great tips. It kind of changes the phrase “ugly american” to “loud american” eh? I didn’t know that we talk so loudly. It’s a good thing to pay attention to. No offense taken. I’m happy to try to fit in and make every attempt to make my country look good while I am abroad. wow… I promise I did not read this before writing my version! It is amazing that we came away with some of the same pieces of advice. Tip 1# should be stay at home, visit your own crappy tourism spots. Seriously the world would be a better place if Americans didnt leave their border. Tip#2 if you must come, dont talk at all. We dont want to give you directions, we dont want to get to know you, we dont want to serve you, we dont care about you, in fact the only reason you are not assualted in the streets upon identification is because of your money. Tip#3 Be invisible. Dont take up space on the tube during rush hour, dont stand in the middle of the sidewalk and check your map. Basically dont let the local population know there are even any tourists there. @Thomas, unfortunately you seem to be one of those stereotypical Parisian that give Parisian’s a bad name…luckily, you are not the majority of Parisian’s. I do respect your opinion, and I do know that at times Americans tend to be louder and oblivious to their surrounds which is why I wrote this post to raise awareness. The “Bonjour Tip” really hits home. My European friends always, bring this up. I’ve tried to consciously do, this not only when traveling, but in my everyday life. It’s funny how it catches so many of us off-guard, when asked? How are you before asking a question. @Catherine, it really turns any conversation around. @Anita, thanks for your feedback! I do find American tourists loud and sometimes inconsiderate, but on balance I also find some Germans and especially the Dutch to be extremely loud, boisterous and oafish. In fact I think it is just the package holiday riff-raff of any culture who display this behaviour. Loud, noisy, red-faced fat people who go anywhere to get beer, go to nightclubs and pointlessly do the same things they do at home, but in a foreign country. @Roger, yep holiday or school break season is the worst of the worst! @Andrew, you bring up valid points! Thanks so much for providing your perspective.